Saint Clare, a wealthy woman from the central Italian town of Assisi, gave up all her possessions to pursue the goals of poverty and service preached by Saint Francis. She founded an order of nuns known as the Poor Clares, which was recognized by the Pope in 1253. This painting depicts the vision of the death of Saint Clare as experienced by one of her followers, Sister Benvenuta of Diambra. In the vision of Saint Benvenuta, the Virgin Mary and a procession of virgin martyrs appeared to Saint Clare on her deathbed. Here Mary, dressed in a rich brocade robe, supports Saint Clare's head, while the other elegantly robed and crowned saints follow behind, identified by the tiny attributes they hold. The work of the Master of Heiligenkreuz, who was probably active in Lower Austria, illustrates the cosmopolitan aspect of the International Style, which flourished around 1400. While his exaggerated figures with their bulbous foreheads and clinging drapery are characteristically Austrian, the anonymous painter must also have been aware of the most advanced art produced at the courts of Paris and Prague. Thus the surface of the panel is worked in a variety of different techniques to fashion a particularly splendid object. Possibly the Convent of the Poor Clares, Eger (Cheb), Bohemia (now Czechoslovakia), or Eger (Erlau), Hungary. (Karl Schäfer, Munich); (Walter Schnackenberg, Munich), 1921/1922-1951; in 1943 a one-third share was acquired from Schnackenberg by Carl Langbehn, Munich, and passed by inheritance to his mother, Marta Langbehn. owned jointly by (Seiler & Co., Walter Schnackenberg, and Alfred Müller, Munich); sold 1951 to (M. Knoedler & Co., New York, with Pinakos, Inc. [Rudolf Heinemann]); purchased 1951 by the Samuel H. Kress Foundation, New York; gift 1952 by exchange to NGA. Alfred Stange, Deutsche Malerei der Gotik, 11 vols., Berlin and Munich, 1934-1961: 11:4. In a letter of 13 February 1965 to Fern Rusk Shapley, in NGA curatorial files, Stange gave Prince Joseph Clemens of Bavaria as the source, but noted that while there was a convent of the Poor Clares in Bohemian Eger in the fourteenth and fifteenth centuries, Clemens did not specify Czechoslovakia or Hungary and so both were possible. There is no verification for the statement in Colin Eisler, Paintings from the Samuel H. Kress Collection: European Schools Excluding Italian, Oxford, 1977: 234, that the panel may have belonged to the Kings of Saxony. English translation of Walter Schnackenberg letter of 12 April 1951 in files of M. Knoedler & Co., New York, giving date of acquisition from Karl Schäfer. Stange's letter of 13 February 1965 also mentions Schäfer as handling the painting. Schnackenberg letter of 12 April 1951. Carl and Marta Langbehn are listed as owners in a Knoedler brochure, in NGA curatorial files. M. Knoedler & Co. account book. Lent by Walter Schnackenberg to the Alte Pinakothek, Munich, in 1926. Sigismundus rex et imperator: art et culture au temps de Sigismond de Luxembourg, 1387-1437, Szépmüvészeti Múzeum, Budapest; Musée national d'histoire et d'art, Luxembourg, 2006, no. 7.40, repro. The support appears to consist of a three-member panel of fir with vertically oriented grain. Direct examination was not possible because the edges of the panel have been enclosed with 0.5 cm thick strips of mahogany and a wooden cradle has been attached to the reverse. On the reverse of the panel is a moderately thick layer of wax. The major design elements of the composition, including the outlines of the figures, the primary drapery folds, major architectural motifs, and numerous details, are incised into the smooth white ground layer that is estimated to be somewhat thickly applied. Sheets of gold leaf have been applied, over a layer of thin, fluid red bole, to the upper background, the halos of the standing saints, and the angels under the canopy at the right. A great variety of punches in a wide range of sizes has been used to create in the gold leaf elaborate designs and figures of angels. Examination with infrared reflectography did not reveal underdrawing. Examination of the technically congruent pendant, The Death of the Virgin, in the Cleveland Museum of Art provided important information about the probable original state of the National Gallery's picture. The Cleveland panel is 1.3 cm thick, and the reverse covered with what appears to be an original layer of white ground; the panel has not been thinned or cradled. One can assume that the Washington panel, presently 1 cm thick, was in a similar state before cradling. In the Cleveland panel a fairly coarse and loosely woven plain-weave fabric is observable between the support and the overlying ground and paint layers. This helps to confirm the use of a fabric interlayer in the Washington painting, which is suggested by the weave pattern visible in the x-radiograph. The metal content pigments of both paintings were analyzed with x-ray fluorescence, and the results for the paintings were very similar. The National Gallery's painting is structurally secure and is in very good condition. Small pinpoint losses are scattered throughout, and some of the paint surfaces are minutely abraded. Larger retouched areas of abrasion are located in paint next to the gilt areas of the canopy, along the left profile edge of the standing Virgin next to Saint Clare, and in the bottom of Christ's red robe. The gilt stars on Clare's bed are badly worn. The identification of the wood as fir (sp. Abies) was made by the National Gallery's scientific research department. An x-radiograph made prior to cradling is in the National Gallery's conservation department. The examination was conducted 7-8 April 1988 by the author and by Paula DeCristofaro, formerly associate conservator for the Systematic Catalogue, with Bruce F. Miller, conservator of paintings at the Cleveland Museum of Art. I am most grateful to Mr. Miller and his staff for their assistance in making the painting available to us. "Meister von Heiligenkreuz." In Hans Vollmer, ed. Allgemeines Lexikon der bildenden Künstler ("Thieme-Becker"). 37 vols. Leipzig, 1907-1950: 37(1950):144-145. Buchner, Ernst. "Eine Gruppe deutscher Tafelbilder vom Anfang des XV. Jahrhunderts." In Buchner Ernst and Karl Feuchtmayer, eds. Oberdeutsche Kunst der Spätgotik und Reform. (Beiträge zur Geschichte der deutschen Kunst. 2 vols.) Augsburg, 1924: 1:3, fig. 2, 4-5. Baldass, Ludwig. Review of Oberdeutsche Kunst der Spätgotik und Reformationszeit by Ernst Buchner and Karl Feuchtmayr, eds. In Belvedere 9/10 (1926): 133-136. Suida, Wilhelm. Österreichs Malerei in der Zeit Erzherzog Ernst des Eisernen und König Albrecht II. Vienna, 1926: 25. Baldass, Ludwig. "Die Wiener Tafelmalerei von 1410-1460. (Neuerwerbungen des Wiener Kunsthistorischen Museums)." Der Cicerone 21 (1929): 66. Stange, Alfred. Deutsche Malerei der Gotik. 11 vols. Berlin and Munich, 1934-1961. Munich, 1961: 11:4. Oettinger, Karl. "Zur Malerei um 1400 in Österreich." Jahrbuch der Künsthistorischen Sammlungen in Wien n.s. 10 (1936): 78. Ring, Grete. "Primitifs français." Gazette des Beaux-Arts 80, 6e période, tome 19 no. 895 (mars 1938): 158. Sterling, Charles. Les Peintres du Moyen Age. Paris, 1942: 15, no. 9. Larsen-Roman, Erik and Lucy Larsen-Roman. "Les Origines provençales du Maître de Heiligenkreuz." Apollo. Chronique des Beaux-Arts no. 18 (1943): 17-19. Ring, Grete. A Century of French Painting 1400-1500. London, 1949: 199, no. 59. Frankfurter, Alfred. "Crystal Anniversary in the Capital." Art News 55, no. 1 (March 1956): 26, repro. Paintings and Sculpture from the Kress Collection Acquired by the Samuel H. Kress Foundation 1951-56. Introduction by John Walker, text by William E. Suida and Fern Rusk Shapley. National Gallery of Art. Washington, 1956: 120-123, no. 46, repro. "The Kress Collection." Arts 30, no. 6 (March 1956): 48, 49, repro. Paintings and Sculpture from the Samuel H. Kress Collection. National Gallery of Art, Washington, 1959: 299, repro. Broadley Hugh T. German Painting in the National Gallery of Art (Booklet no. 9 in Ten Schools of Painting in the National Gallery of Art, Washington, DC). Washington, 1960: 2, 12-13, color repro. Musper, Heinrich Theodor. Gotische Malerei nördlich der Alpen. Cologne, 1961: 119, repro. Walker, John, Guy Emerson, and Charles Seymour. Art Treasures for America: An Anthology of Paintings & Sculpture in the Samuel H. Kress Collection. London, 1961: 18, 21, , color fig. 16. Cairns, Huntington, and John Walker, eds., Treasures from the National Gallery of Art, New York, 1962: 50, color repro. "Austria, Bohemia, Tirol: Paintings." The Bulletin of the Cleveland Museum of Art 50, no. 7 (September 1963): 201, under no. 3. Walker, John. National Gallery of Art, Washington, D.C. New York, 1963 (reprinted 1964 in French, German, and Spanish): 110, repro. 111. Cooke, Hereward Lester. Galeria Nacional de Washington. Translated by Maria Teresa de la Cruz. Madrid, 1965: 216-217. Summary Catalogue of European Paintings and Sculpture. National Gallery of Art, Washington, 1965: 85. Cairns, Huntington, and John Walker, eds. A Pageant of Painting from the National Gallery of Art. 2 vols. New York, 1966: 1:100-101, color repro. Cuttler, Charles D. Northern Painting, from Pucelle to Bruegel: Fourteenth, Fifteenth, and Sixteenth Centuries. New York, 1968: 51. European Paintings and Sculpture: Illustrations (Companion to the Summary Catalogue, 1965). Washington, 1968: 75, no. 1162, repro. Galvan, Jose Maria Moreno, ed. Galleria Nazionale di Washington. Madrid, 1968: 35, 38-39, fig. 25, 31. Gandolf, Giampaolo et al. National Gallery of Art, Washington. (Great Museums of the World.) New York, 1968: 98, 99, color repro. Steingräber, Erich. "Nachträge und Marginalien zur französisch-niederländischen Goldschmiedekunst des frühen 15. Jahrhunderts." Anzeiger des Germanischen Nationalmuseums (1969): 32, 34, fig. 6. Musper, Heinrich Theodor. Altdeutsche Malerei. Cologne, 1970: 28, 92, no. 18, repro. 93. Stechow, Wolfgang. "Master of Heiligenkreuz, ca. 1400." The Cleveland Museum of Art. European Paintings Before 1500. Catalogue of Paintings: Part One. Cleveland, 1974: 4-5, repro. Cinotti, Mia, ed. The National Gallery of Art of Washington and Its Paintings. Great Galleries of the World. Edinburgh, 1975: no. 92, repro. European Paintings: An Illustrated Summary Catalogue. National Gallery of Art, Washington, 1975: 222, repro. 223. Walker, John. National Gallery of Art, Washington. New York, 1975: 147, no. 154, repro. 146. Eisler, Colin. Paintings from the Samuel H. Kress Collection: European Schools Excluding Italian. Oxford, 1977: 232-236, figs. 225-226. Watson, Ross. The National Gallery of Art, Washington. New York, 1979: 51-52, pl. 33. Walker, John. National Gallery of Art, Washington. Rev. ed. New York, 1984: 5, repro. 3. European Paintings: An Illustrated Catalogue. National Gallery of Art, Washington, 1985: 254, repro. National Gallery of Art, Washington. National Gallery of Art, Washington, 1992: 56, repro. Ströter-Bender, Jutta. Die Muttergottes: Das Marienbild in der christlichen Kunst, Symbolik und Spiritualität. (DuMont Taschenbücher 282) Cologne, 1992: 132-133, fig. 39. Hand, John Oliver, with the assistance of Sally E. Mansfield. German Paintings of the Fifteenth through Seventeenth Centuries. The Collections of the National Gallery of Art Systematic Catalogue. Washington, 1993: 127-132, color repro. 129. Löcher, Kurt. "Rezensionen." Review of German Paintings of the Fifteenth through Seventeenth Centuries, by John Oliver Hand with the assistance of Sally E. Mansfield. Kunstchronik 43 no. 1 (January 1995): 18. Donahue, M. Patricia. Nursing, The Finest Art: An Illustrated History. St Louis, 1996: 128-129, repro. Oberhaidacher, Jörg. “Zur kunstgeschichtlichen Herkunft und Bedeutung des Meisters von Heiligenkreuz.” Österreichische Zeitschrift für Kunst und Denkmalpflege 52 (1998): 501, 510, 514, fig. 533. Barnay, Sylvie. Le ciel sur la terre: Les apparitions de la Viere au Moyen Age. Paris, 1999: 115, color repro. Oberhaidacher, Jörg. “Zur Datierung der Güssiger Maria-gravida-Tafel in der Ungarischen Nationalgalerie in Budapest.” Pantheon ser. 2, 57 (1999): 59-60, fig. 7. Southgate, M. Therese. 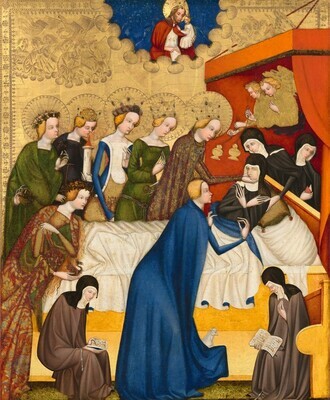 "The Cover: Master of Heiligenkreuz, The Death of Saint Clare." Journal of the American Medical Association 282, no. 19 (17 November 1999): cover, 1798, color repro. Pernod, Régine. La Femme au temps des Cathédrales. Paris, 2001: 38-39, color repro. Hand, John Oliver. National Gallery of Art: Master Paintings from the Collection. Washington and New York, 2004: 60-61, no. 46, color repro.